First of all, thank you so much for pointing out where Viva had disappeared to. I was really distracted and when I turned around and noticed she was gone my brain immediately short-circuited and went to the following headline: GAY MORMON MARRIED MAN WHO RECENTLY CAME OUT LOSES DAUGHTER AT MALL BECAUSE HE’S TOTALLY IRRESPONSIBLE AND SHOULDN’T BE A PARENT. OBVIOUSLY HE SHOULD HAVE PARTNERED WITH A MAN. AND THEN CHOSEN NOT TO ADOPT. But anyway, while I have you here, I wanted to defend and minimize explain a few things you might have noticed in my behavior while I was busy not remembering that people actually recognize me in public places these days. I needed him to know that if he wants to do a photo shoot in a mall, that’s totally fine. But if he wants to do a photo shoot in a mall where no children cross an invisible line into the “off limits” section, setting up said shoot directly in front of the carousel is a very, very bad idea. 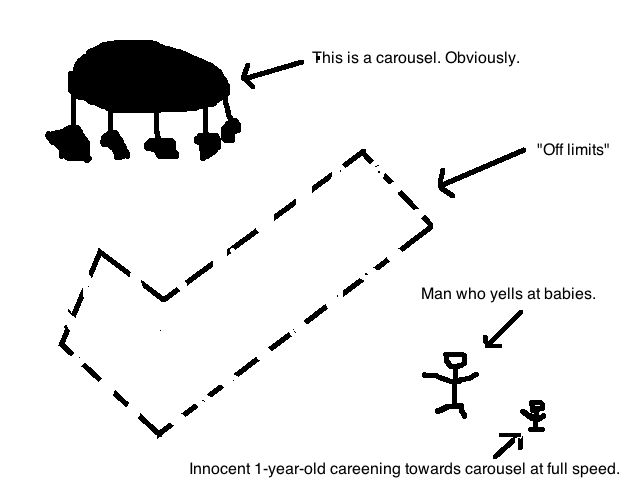 I don’t know if he’s met a child before, but the formula goes something like this: child sees carousel, child experiences adrenaline rush leading to near-cardiac-arrest, child runs full throttle towards the carousel in a direct line without consideration of invisible barriers or one pink “caution” sign arbitrarily placed upon said invisible barrier. Yelling at my child for doing this is pointless. A one-year old will not learn how to not have this response to a carousel. The same rule applies but is not limited to: Chuck E. Cheese, toy stores, Grandpas, large stuffed animals, any Disney character anywhere, and busily trafficked roads. This is part of growing up as a human. Second, when you saw me scratching my nose, I was really just scratching my nose. I didn’t mean to have to flick. Accidents happen. Third, I washed my hands. Anyway, you can see why when you approached me after pointing out Viva had disappeared into an automated photo booth, I probably seemed a little sheepish. But I wanted you to know that I really appreciated you saving Viva’s life, and that I actually really enjoyed that you came up and talked to me, and also thanks a lot for reading my blog. Oh, and btw, the ADHD responses last post were *incredible*. I'm still narrowing down the ones I want to share (but, SHOCKINGLY I have read them all). Thanks so much, everybody for sharing your thoughts and insights. ""I hate shopping so, so, so, so, so, so, so, so much." (<—Totally ironic because I'm gay, amiright?)" So many shoe-shopping-with-my-gay-friend-Josh dreams were just crushed. Are you at least any good with flowers? Talking about shopping – today we went out to buy my husband new smart trousers ('pants' in the New World). Then, as I return to your blog and watch the background loading I realise what my inspiration was. If it makes you feel any better, I left Vienna at a stranger's house today on accident and my cell phone was dead so I found out when I got home. With my history, you know I broke the speed limit and had 12 heart attacks on my way to get her. She's fine, but I need more therapy! If you haven't lost your kid AT LEAST once, you haven't lived. As shamed as I am to admit this, once my very "active" toddler managed to get his head through the railing that was supposed to prevent a toddler suicide. I had my other 3 children and mother-in-law with me. As I was trying to compress his ears and get his head back through to safety (and I know he could have so gotten the rest of his body through the railing and fulfilled his death wish–he was that creative), a mall employee comes along and says, "don't let him do that!" Uh, yeah, lady, I told my firstborn son, "I've got too many kids. Go see if you can drop 60 feet to your death." A harness is your friend, Josh. Even though people will give you dirty looks for "leashing" your child, it helped keep my sanity at the mall when my kids were small. And contrary to popular belief, your children will not be scarred for life. I used a harness with my three. I used to attach only one end so it really looked like a lead rather than a loop. It gave the child more distance. I got admiring rather than strange looks (other than in continental Europe – they really didn't get it there). I would let the lead hand loose while we sauntered along and only ever tightened it to avert mishap. It was quite handy for breaking their fall too. I don't know how many times I lost my youngest at the store, but now that I think about it, I believe he was trying to lose me…haha! Eerie. That's just what happened to Savannah Smiles (Liberty park and everything). I'm glad she didn't return home several weeks later with a puppy. First I'd hug my kid. Then I'd be like "WHO GAVE MY KID THIS PUPPY???" The good old Josh is back. Welcome! As for ADD, you do not fight it. You embrace it. And you will realize that all those petty little things you are occupied with while other "terribly important stuff" passes by you are actually terribly important, while the rest is handled by others like a charm. my parents left me at a rest stop on a trip when I was 7. They didnt realize I was missing for 20 miles 🙂 It happens. This is definitely my favorite of all your blog posts ever. I remain your faithful (albeit confused) fan* in the blogesphere. I also really liked your diagram and found it helpful in understanding the story. Temporarily misplacing a kid usually turns out okay in the end but there are so many damn Lifetime Television For Women movies that we forget it will all turn out and we will joke about it some day. *I call myself a fan but I want to clarify that I have never sent a gay an email with a link to your coming out post like all "this should clear some things up for ya just trying to be helpful". I am not THAT fan but a fan nonetheless. When I was 2, I escaped my mom and was found walking along a freeway overpass several minutes later! I was confused because mom was crying upon our reunion. When I was 4 or 5 I wandered from my parents (I knew where they were the whole time! lol) for no more than 3 minutes and when they "found" (like I said, I knew where they were) me again, my mom was crying. I was so confused as a young child who didn't understand the dangers of wandering away at a mall. (only 1 or 2 years after Adam Walsh). Did it make the international news when our Prime Minister (David Cameron) left his 8-year-old daugher at a pub recently? The family were there in two cars and each parent thought he other had her. The press got all self-righteous about it, but my biggest concern was that the PM's security detail didn't notice anything amiss. I was thinking about the same thing (of course, I live here in the UK too). I remember reading about Cameron's oops moment and thinking "there but for the grace of God . . ." My two-year old has run off several times and is a little escape artist. I live in fear of the times she's snuck out the gate and down our busy street. I think as parents and especially parents with more than one child to look after, a lot of us have had a child get away from us in a public crowd situation. I lost one child at a Highland Games one year. Fortunately he was found and taken to an information booth and an announcement went out over the PA system. And I lost another one at the Pacific Science Center when she decided to go out a door to an outside courtyard while the rest of us were inside. So easy to lose them in a crowd. And yet another one was lost while school shopping at JC Penney. All of these stories had happy endings and I'd say that's probably the norm more than the ones we hear on the news that end badly. Maybe I should have tied a rope to each of them. I'm just grateful that my wandering child, now in his teens, has sprouted up to be the tallest member of the family. He's now fairly easy to spot. (He still wanders.) And when we can't see him, we can call him on his cell phone. So it does get better over time. Your blog posts routinely make my days a little brighter, Josh — so thank you, from my heart!! Hhahahaha! Thank you very much for this hilarious story. OMG………. I am DYING/CRYING at the wedding invites "graphic art". Man, if I got a shout out for every time I found one of your kids wandering off- I would be famous! Or at least JT would – because, let's be honest, I am with you gawking at the carousel and trying to remember if I have two kids or three now-a-days. Hhhhmmm or maybe I am with Lolly and Viva touching every hand band in sight.